The fresh-faced lawyers included refugees from violence and persecution in Central America, as well as the grandchildren of refugees from Eastern Europe. They arrived at the United States Court of Appeals for the Second Circuit, in Manhattan, on Thursday in similar shades of gray and black suits, poised to continue their training in a new program to help represent immigrants. Hands covered open mouths, and gasps rose from the 25 lawyers, who make up the inaugural class of the Immigrant Justice Corps, whose goal is to address a growing problem: the dearth of qualified lawyers to represent immigrants facing deportation and other legal problems. Tiptoeing around a young lawyer’s question about what an ideal immigration system might look like in 100 years, Justice Sotomayor suggested that the current one was not meeting society’s needs. “A lot of the immigrants who are coming, like some of those in this room, are coming because of asylum needs,” she said. Domestic labor problems also weighed on her. “We’re in a really dysfunctional system right now, where the community obviously is hiring and employing illegal aliens, so there’s a need,” she said. In using the phrase “illegal aliens,” Justice Sotomayor inadvertently broke her own rule to instead use the phrase “undocumented.” The rule, which she explained earlier to the group, was a way to recognize that immigrants who break the law are not necessarily bad people. The lawyers were joined by 10 recent college graduates with multilingual skills who will help handle less complex cases for the group. Three of those advocates are themselves undocumented immigrants, and would not have been eligible to work had they not qualified for deportation deferrals that include permits to work legally. Melissa Garcia Velez, 22, a recent graduate of Lehman College and an undocumented immigrant from Colombia, said she felt the sting of being ineligible for scholarships when she applied to schools. She said Justice Sotomayor’s encouragement fortified her. 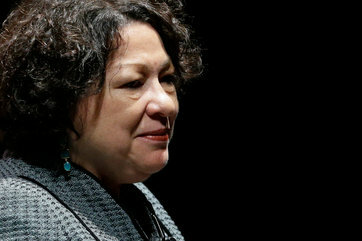 Justice Sotomayor said that Puerto Ricans’ status as United States citizens mostly shielded her family from the immigrant experience. But, she added, a sudden explosion of immigration cases that came before her as an appeals court judge in the early 2000s taught her the perils of incompetent representation. “Immigrants were being hoodwinked, sometimes by their own people,” she said. After everyone had spoken, the lawyers, advocates and Judge Katzmann surrounded Justice Sotomayor at the front of the courtroom for a ceremonial photo, a sea of monochrome suits that belied a spectrum of diverse origins.